SWOT is a business tool to analyze internal and external factors that can affect your business. SWOT Analysis, also known as SWOT Matrix, helps you evaluate strengths, weaknesses, opportunities and threats that your company face by focusing on your strengths, minimizing threats, and taking the greatest possible advantage of opportunities available to you. 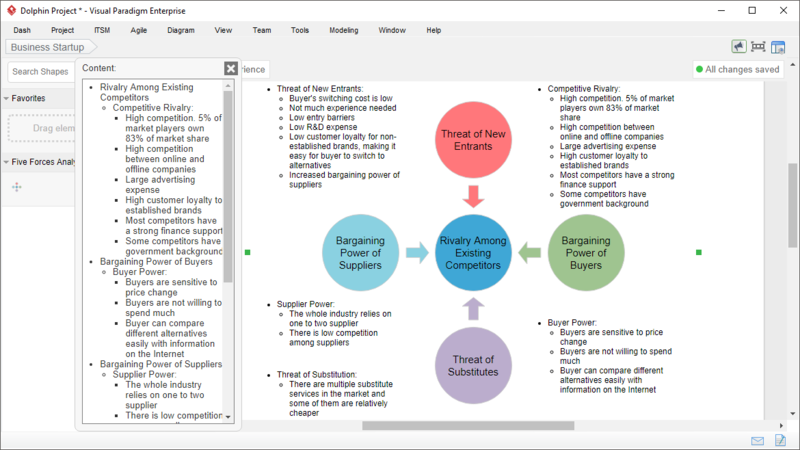 Our SWOT Analysis tool allows you to easily and quickly develop a SWOT Analysis model by using Visual InfoArt. 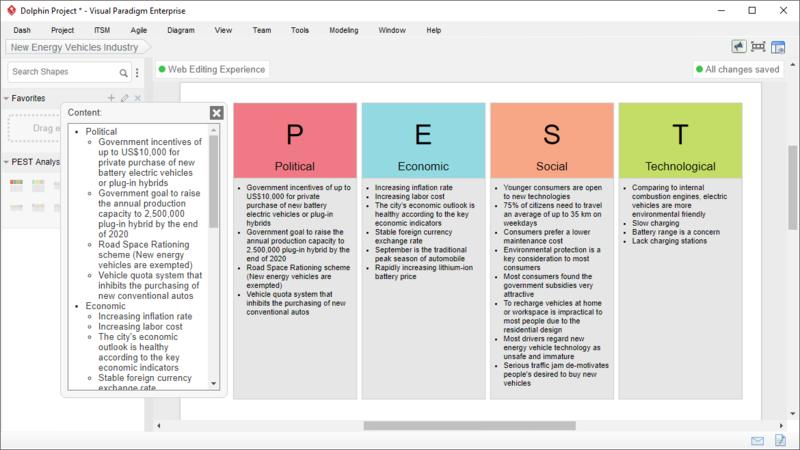 Now, you can focus on fact-finding of the SWOT by listing out the information in bullet points. 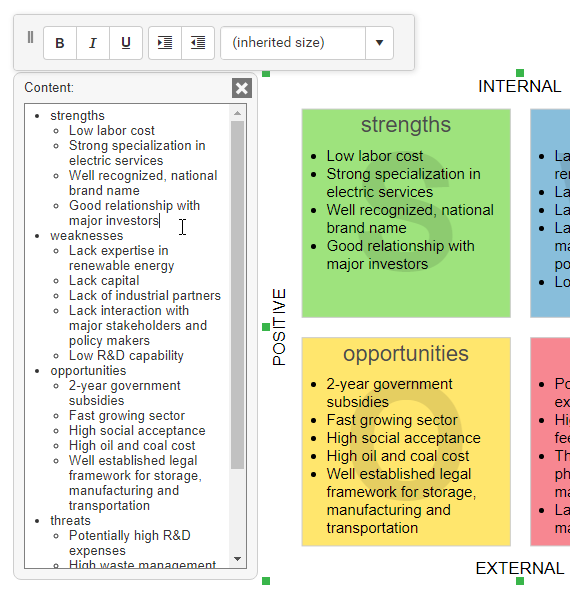 InfoArt will automatically present your information in SWOT Matrix form professionally. 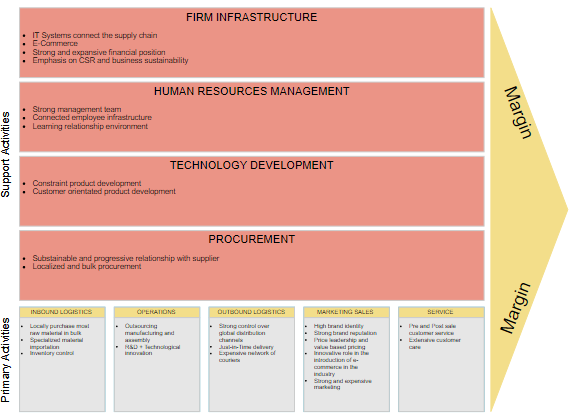 A Value Chain Diagram is a visual representation of a value chain, which is a set of activities that a business perform to deliverable a valuable product or service for the market. 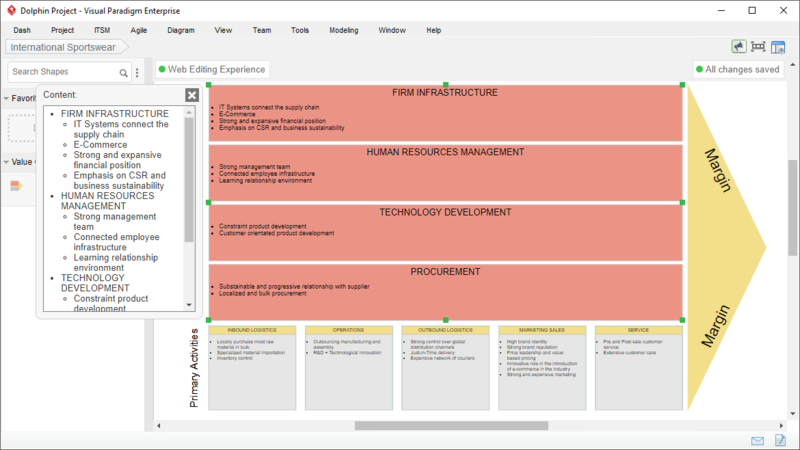 Our Value Chain Diagram tool makes drawing Value Chain Diagram easy with the help of easy bullet editor and auto layout capability! You just need to enter the primary activities and support activities, then the Value Chain Diagram will be formed automatically. No manual work, no distorted graphics! Of course you can always adjust the height, color or other look & feel of the infoArt, if you wish to. Getting to know your competitor's strengths and weaknesses can be crucial to your business's success. The competitor analysis tool enables you to compare your brand with your competitors by documenting and comparing their background, marketing strategy, competitive edge and SWOT. You can freely customize the map to include additional lanes to suit your needs. Getting to know the underlying causes of incidents and problems can prevent recurring issues and thus saving you significant operation costs. 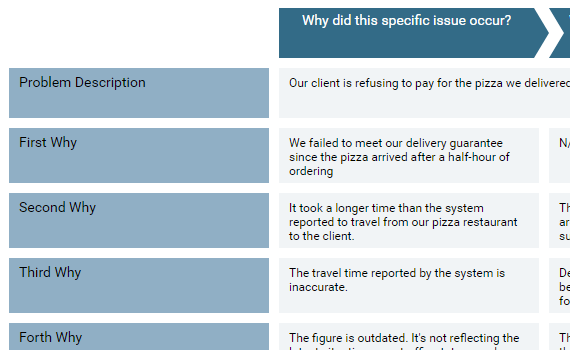 While traditional root cause analysis techniques are lengthy, costly and error-prone, our Root Cause Analysis tool provides you with several professionally designed cause analysis templates that speeds up problem analysis and prevention. You may customize the tools by including the columns and lanes you need, or to develop a new one as needed. 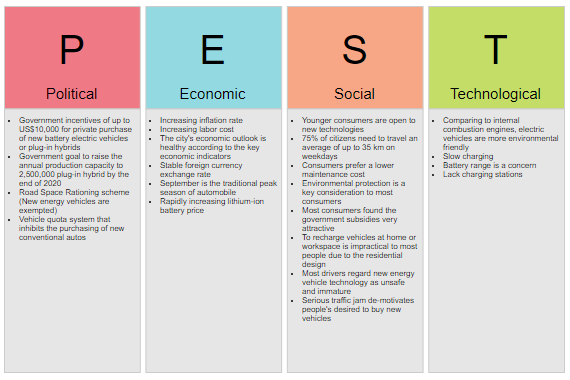 PEST Analysis, short for Political, Economic, Social and Technological Analysis, is a strategic management tool used to assess the four external environmental factors. Each of the PEST factors may represent constraints or opportunities, depending on circumstances. They should periodically be identified, understood and analyzed by the company so it can achieve optimum performance. As the factors vary, a PEST chart has many different forms such as PESTLE (i.e. PEST + Legal & Environment), SLEPT, STEPE, STEEPLE, etc. Nevertheless, PEST and PESTLE are by far the most widely used ones. 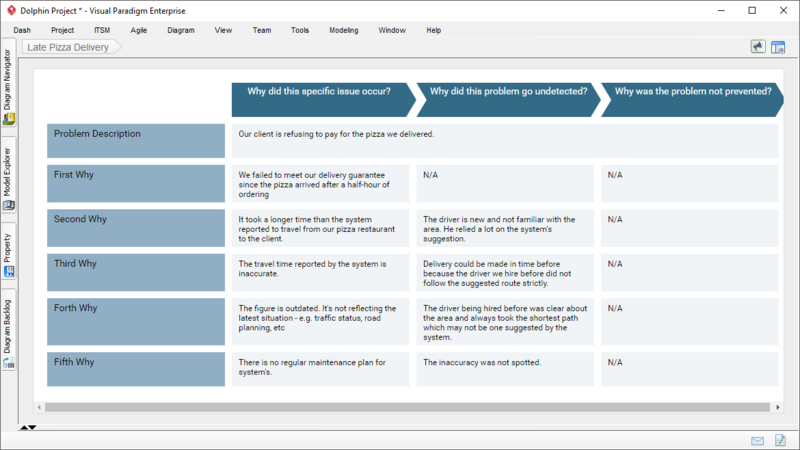 InfoArt is flexible enough to let you re-configure the template to match all these forms of PEST Analysis above easily. 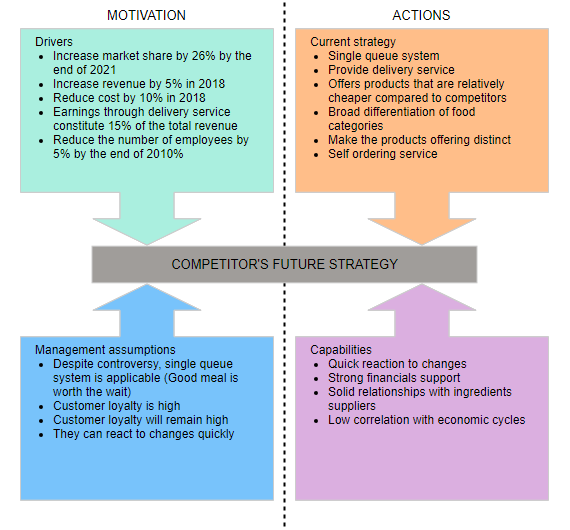 Also known as Five Forces Framework, Five Forces Analysis identifies five competitive forces that shape a business. 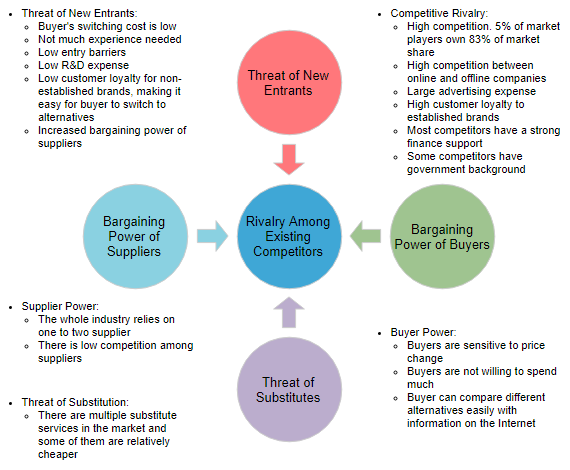 These forces are: Threat of new market player, threat of substitute products, power of customers, power of suppliers, industry rivalry which determine the competitive intensity and attractiveness of a market. 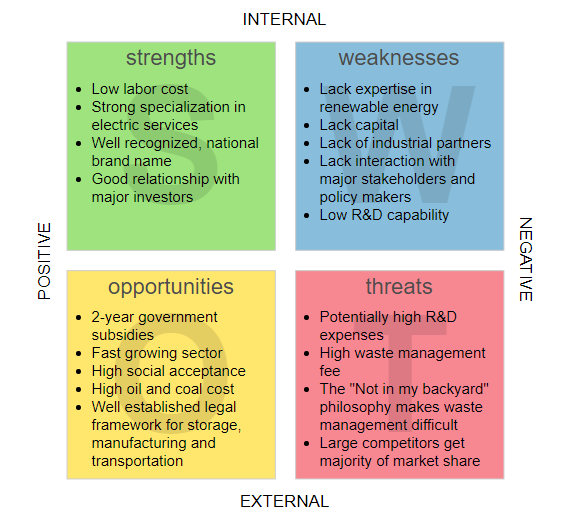 Five Forces Analysis helps to identify where power lies in a business situation. This is useful both in understanding the strength of an organization's current competitive position, and the strength of a position that an organization may want to move into. 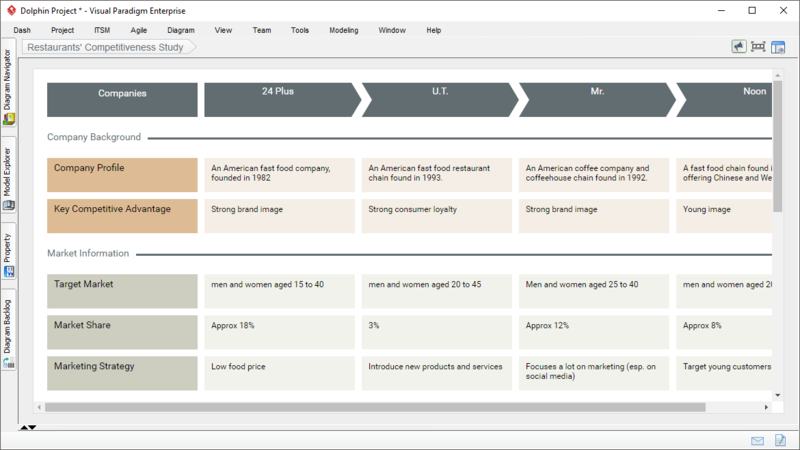 Four Corners Diagram, known as Four Corners Model, is a strategic analysis tool that helps determine a competitor's course of action by predicting future moves of your competitors based on your own strategic move. 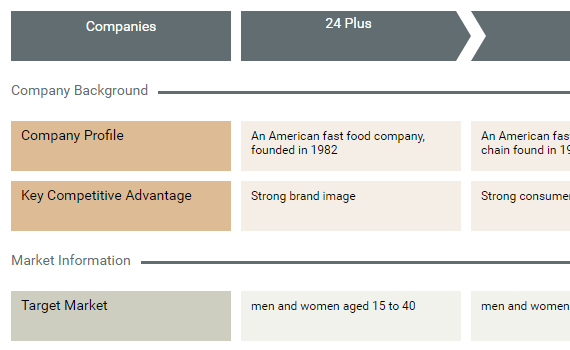 The 'four corners' refers to four diagnostic components that are essential to competitor analysis: future goals (also called drivers); current strategy; management assumptions; and capabilities. Understanding these four components can help you to predict how a competitor may respond to a given situation. 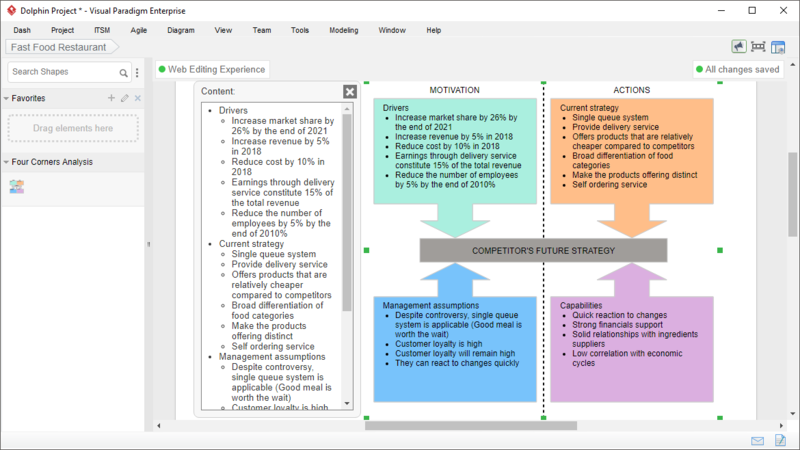 The idea behind developing a strategic analysis model with an InfoArt graphic is to facilitate a more accurate and efficient analysis process that focuses mainly on analyzing, not drawing. That's why our InfoArt graphic has included several smart features that help you automatically arrange and position your content. One of the smart features is the automatic adjustment of cells' font size, which ensures that the text content in a graphic is always within shape boundary and remain consistent regardless of diagram's size. 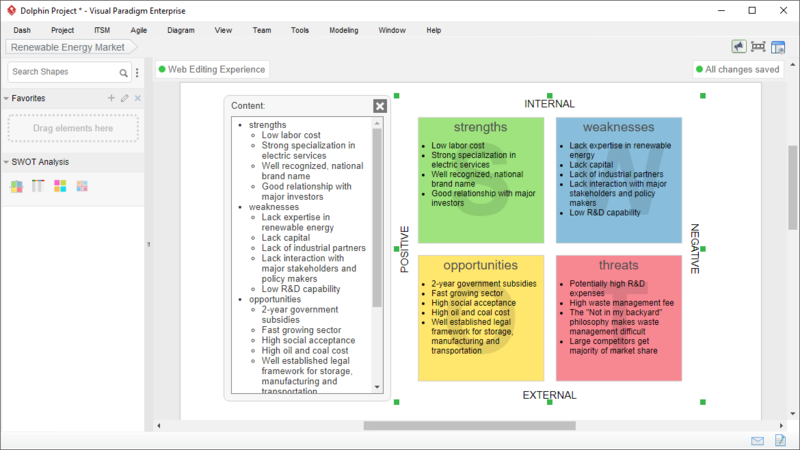 For instance, the content of the 'S', 'W', 'O' and 'T' cells in a SWOT Analysis diagram will always maintaining the same font size regardless of the volume of content in any particular cell.